A cry of the African Child is a child non-profit organization registered under the companies ACT, 1963, ACT 179 SECTION 27 and 28, which envision to promote quality education and welfare in Ghana and Africa as a whole the future to come. A cry of the African child (COTAC GHANA) has come to identify and resolve issues pertaining to child education and welfare. Our main goal is to be the mouthpiece of child education and welfare through engagement with the major stakeholders of our society. 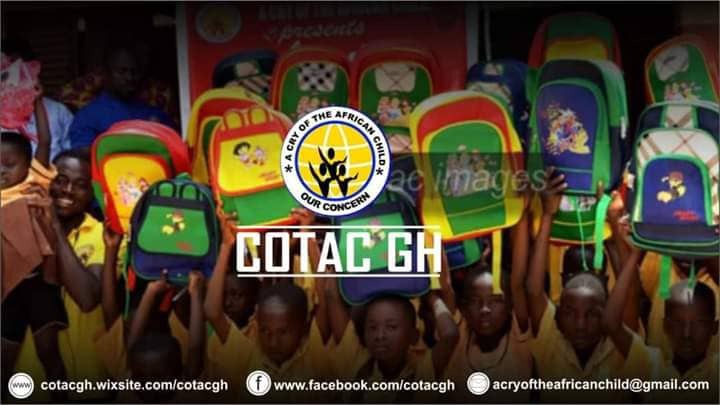 Over the past few years COTAC GHANA has demonstrated its commitment to child education by donating educational materials like books, pens, pencils, mathematical sets, story books, school bags and other materials like clothes, shoes among many others to motivate kids in rural areas towards their education. This year the organization has sought to spread its operations to others rural areas like the wioso-nerebehi community in the Bekwai Ashanti to donate educational materials to empower them towards their education. We believe that achieving quality education is collective and therefore your donation will contribute to achieving our goal. 30 pieces of school bags will be purchased and donate to needy school kids in the community. 3 boxes of pens will be purchased to support the junior high school students in the community.